How can you visit Seoul and not participate in their obsession with beauty? Even if you’re not genetically gifted with pore-less, porcelain skin, you have hope in Korea, in the forms of masks, serums, potions and lotions. I love my beauty products as much as the next person, so I was quite willing to partake in the madness of Myeongdong, Seoul’s district for cosmetics and beauty products. (To get there, take the subway, Line 4, to Myeongdong Station, and come out of Exit 6). But you might be surprised to find out that I only spent a grand total of 20 minutes on this street. I made it to Aritaum, Holika Holika, Nature Republic, and Innisfree before I retreated back to the quiet serenity of Nakseongdae. I would have liked to say that it was a pleasant shopping experience, but it was not. Of course, that won’t stop me from making the trip again, on my next trip to Seoul, but the next time I go, I’ll be armed with two other friends, one on each side, so we can bolster each other’s resolve to keep moving forward. Why was it so unpleasant? The crowds for one. I was sort of prepared for that. The second most unpleasant part was the customer service, or lack thereof. It wasn’t so much a language barrier, because a lot of the staff were quite fluent in Chinese. In one store, an assistant was particularly aggressive, and tried to ring up additional items that I didn’t want, so I could get a discount from the same brand. In another store, they were blunt to the point of rudeness. I asked if I could buy a particular face mask in smaller numbers, than the sets they had on display (seriously, who buys the same face mask in packs of 50 or 100?!) They said, buy 50, get 50 free. I said, yes, I understood that, but is there is a smaller pack, they said “yes, buy 20, get 20 free.” Which for me, was about the right amount that I wanted. But she kept shoving the pack of 50s at me, and saying “You should buy this one, it’s a better deal.” I tried to explain, I didn’t want that many, and she said “if you don’t have money, then you can use your credit card.” Again, what?! I know you probably can’t tell from the photos below, but I’m not really a bulk shopper (!!) when it comes to cosmetics. I’m not particularly loyal to a particular brand, especially when it comes to highly disposable products, like face masks. In the end, I stood my ground, and just bought enough for me, enough to share with some friends back home, and some as gifts for colleagues at work, and was satisfied with my purchases. Aritaum, or Korea’s version of Sephora, can be found throughout Seoul, so don’t feel pressured to just limit your shopping to the one in Myeongdong. I liked this particular store for two reasons, the staff were genuinely helpful, and you can get your tax refund right then and there, if you spend over 30,000 won (which sounds like a lot, but it’s around $30 USD) They just helpfully deduct it from your total, and you can be on your merry way. Instead of other stores, who just give you a tax refund receipt to claim at the airport. 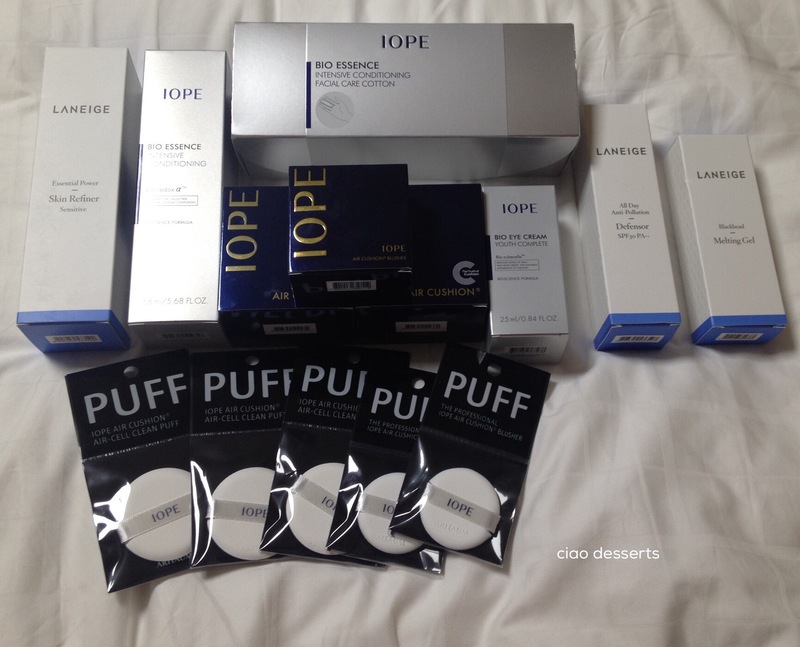 Products that I bought this time at Aritaum were mainly from the Korean brands IOPE and Laneige. You can’t buy IOPE easily in Taiwan, and Laneige costs a bit more at the department store counters. I have high hopes for IOPE’s bio essence! I’ve also jumped on the cushion foundation bandwagon, decided to try the ones from IOPE and Sulwhasoo. However, I didn’t find Sulwhasoo at Myeongdong, probably because it’s more of a department store brand, so I decided just to wait and see if I could buy it at the airport. I was amazed that even though Gimpo Airport is much smaller than Incheon, there was pretty much everything you needed at their duty free counters (brands included Sulwhasoo Hera, Laniege, among others). I found my Sulwhasoo cushion, and it came in a travel pack deal. I also bought their makeup balancer. The saleslady included several different, generously sized samples from Sulwhasoo, and Laniege and Hera. In addition, I bought a pack of Tony and Moly hand lotions, to bring back as gifts. I was surprised to see that a pack of 10 tubes, came with two full-sized tubes free. In my experience, the most significant savings were found in the Sulwhasoo products; the balancer, where I saved around $475 NTD (approximately $15 USD), and the cushion, where I saved around $719 NTD (approximately $24 USD). The masks are cheaper in Korea, but then also factor in the reality that they are pretty heavy, especially if you buy them in packs of 10-20 (or more). The ones I bought ended up taking up about 2-3 kgs in my luggage. So I think my future strategy, is to devote most of my luggage space to the cosmetics products, which are heavier, and absolutely need to go in my checked baggage. Then, if I have any energy (and cash!) leftover, carry the masks in my carry on luggage, or just buy them at the airport. I found that the sales staff at the duty free counters were helpful, courteous, and quite generous with their samples too. 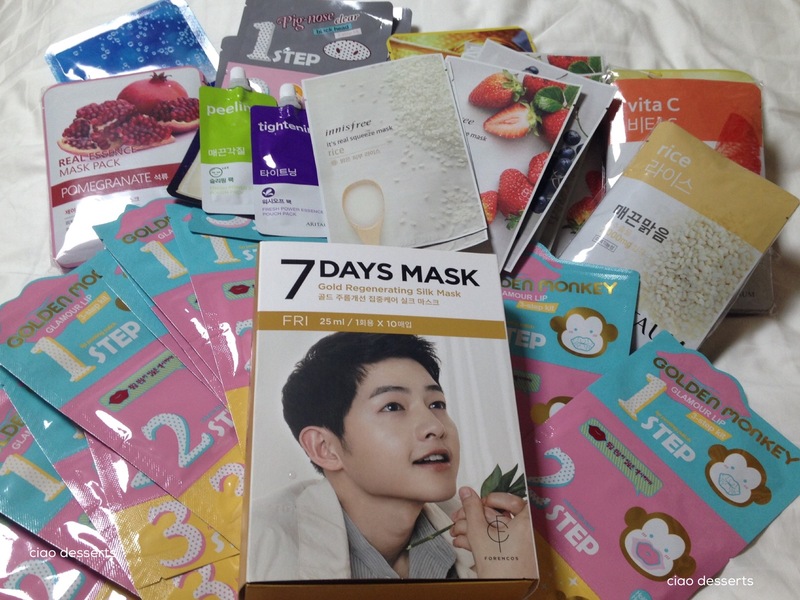 I’ve been willing to try out Korean beauty products for a good while now, but honestly I didn’t know any specific brand so I wasn’t sure were to start exactly. Now I can check IOPE out thanks to your review! 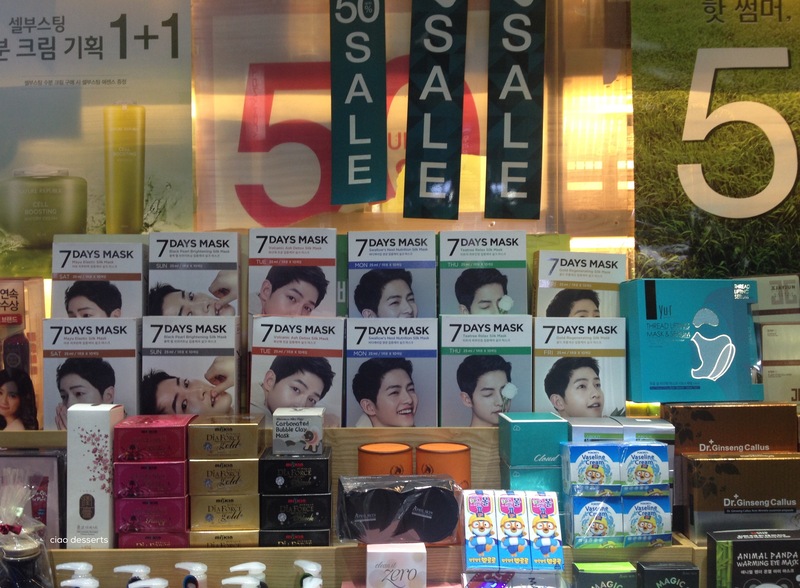 An entire district for beauty and cosmetics, oh my 😀 In Korea they take the issue seriously! Hi Julia, So far, I’m really enjoying the IOPE products. I haven’t tried the others yet, but I’ll get to them soon.